I once read an article that suggested that deja vu, the feeling of familiarity with a situation or place that you haven't been before, is simply a case of memories being stored out of order. Instead of the usual case where something gets put in your short-term memory, and then if it is judged worthy, moved to the long term memory, a case of deja vu is when something is put in long term memory before short term memory. Therefore, once the memory is put in your short-term memory, your brain finds it in long term memory, but can't link it necessarily to any actual event in time or space. Instead, it just comes across as a weird feeling that you've been here before. Yesterday, I was out looking at a flat in the west-end. After checking out the place, I went for a walk around the neighbourhood, and after checking it out, wandered farther afield. I walked for nearly 45 minutes before wandering into a pub on Gloucester Street called the Gloucester Arms. I ordered a pint and started looking at the menu. Looking around, something seemed really familiar about the place. The set up of the tables, the weird angle of the one wall, the flat screen TVs mounted high on the walls. "Do I know this place?" I wondered. It seemed unlikely, I hadn't been out this way in ages. In fact, I hadn't been in this area of town since moving to London. In August of 2007, though, I was in the area. I stayed at a hotel just a 10 minute walk away, and once I realized that, I knew when I had been here before. It was here that I had my bangers and mash in August of 2007. In my blog entry for my trip to London, I wrote about the pub meal I had at the Gloucester Arms after being told that food in North America was bad for you. 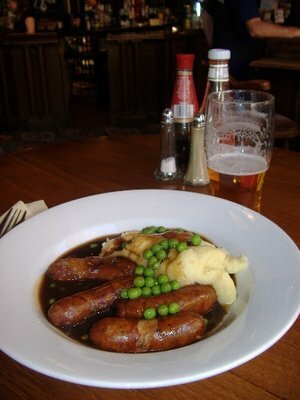 The next day, I ordered bangers and mash in a pub. I am not certain that 4 sausages with a side of potatoes flooded in gravy is exactly health food, but who am I to argue with the nutritional expertise of a drunken drywaller in a London pub. I skipped the bangers this time, and order the Chicken Kiev, and reflected on the fact that some times that old familiar feeling is because you have been some place before, it just takes a minute to remember it. It's good you kept it healthy this time around. Happy last day of workday freedom!